This year the book market started off with a bang, situated at the top four levels of a disused carpark in Peckham which is also home to Bold Tendencies and Franks Cafe which are only open during the summer months. This venue, although slightly difficult to locate, brought in a large crowd and had a queue of people lining up to get in. For those of you which may not have heard about Copeland book market, it is a platform for print and publishing based around an annual four-day event. 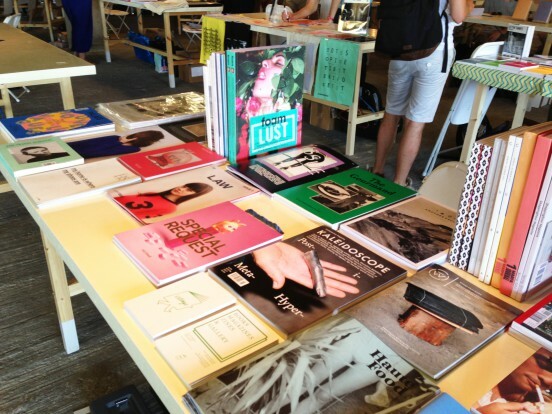 A curated group of publishers and artists, ranging from the established producing high-end monographs to small independent groups making zines and low edition artist books, are brought together on stalls for the weekend. Artist projects, talks, screenings and performances make up a significant and related events programme. Each year the market is specially designed and built, this year the stall holders tables where made from wooden firedoors, that fit together in almost a flat pack design, and secured with rope with singular light bulbs hung over each table. The location alone is an experience, the open walls show arguably one of the best views of the city and the concrete walls bounce the sound to create a buzzing exciting atmosphere that carries on long after the book market closes. From the stall holders there are publications that will fascinate any self-publishing enthusiast. Just to mention a few, some of my favourites where: MELK, Preston is my Paris, Village Bookstore, Cafe Royal Books, ,Trolley Books and Four Corner Books. Along with the market for entertainment there was a rolling list of talks and performances. The white review lauched Issue 08 of their magazine, and live performance from a steel orchestra performing Jeremy Deller’s English Magic, needless to say bought in a big crowd. And to top off the friday night events there was an after party by Preston is My Paris after at Peckham Liberal Club.